No two consecutive golf shots are exactly the same. Line of sight, footing, lie and numerous other variables will affect the way you address and attack your golf ball each and every shot. Certain shots require a change of weight distribution, others a fragmented swing. And then there are those shots that demand hitting down on the golf ball to get it up and out and to your target with a higher launch angle. Whether you’re floating on a water hazard or nestled in a divot, hitting down on the golf ball is a valuable technique that can get you out of a lot of trouble situations. In this lesson, we teach you the proper adjustments you need to make to your setup and swing when hitting down on the golf ball in order to put a solid stroke on the ball and avoid ending up in further trouble. Hitting down on the golf ball is a necessary skill for a variety of situations on the golf course. 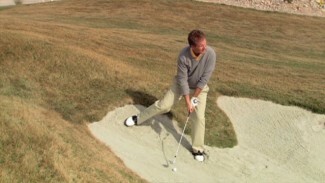 Depending on the trouble spot in which you find yourself, it can be useful for escaping steep bunkers, hitting out of divots and saving yourself from a mucky water hazard. And the great thing is, like most maneuvers in golf, hitting down on the golf ball isn’t that difficult once you learn the proper adjustments to make to your stance and swing. To help you figure out the right way to manipulate your golf stroke for hitting down on the golf ball and increasing the launch angle of your swing, PGA Professionals Blake Cathey and Ron Philo Jr. demonstrate the expert technique for hitting down on the golf ball from a variety of lies. You’ll learn how to steepen your angle of attack and avoid breaking at your wrists to get out of several types of trouble, including filled and unfilled divots and water hazard fringes. Take the time to learn the proper execution for hitting down on the golf ball, and you’ll save yourself a lot of headache your next time out on the course!